This was a nice change for me. It's a historical YA with a paranormal twist to it. I normally don't read historical, but this one I enjoyed a lot! Violet and Colin have been friends since forever. They both deal with Violet's mother's nasty temper and her little schemes. Her mother is a con-artist who pretends she can see and speak to the dead. All of Violet's life has been pretty much doing anything and whatever her mother says. Colin who isn't related to them at all just sticks around. Being so used to her mothers "seances" and knowing what part she has to play it in all, Violet doesn't really see anything in her life changing anytime soon. Well, except maybe that her mother is trying to marry her off to a rich young man. They are off to another show and when they arrive Violet did not expect visiting the ghost she begins to see. The ghost wants Violet's help in finding her murderer. At times I felt so bad for Violet. Her mother really didn't care about her unless it would somehow benefit her. She used Violet and Colin for her own pleasure and money. She knew how to pick pockets, and at such a young age Colin and Violet learned how to pretty much survive on their own. 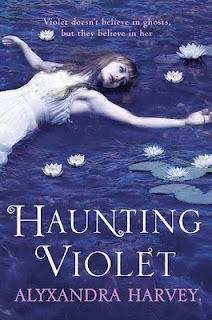 The romance in Haunting Violet was a nice change for me. Colin and Violet have been close since they were little, and as they got older slowly begin to have feelings for each other. Colin was always there for her like a big brother and best friend. He wasn't over whelming or to controlling. It was perfect! THEY were perfect for each other. Colin made sure he did whatever he could to help her and protect her. Haunting Violet is very sad and suspenseful, but with a happy ending. I really enjoyed it and I hope Alyxandra Harvey gives us some more of Colin and Violet in another book. A great read!